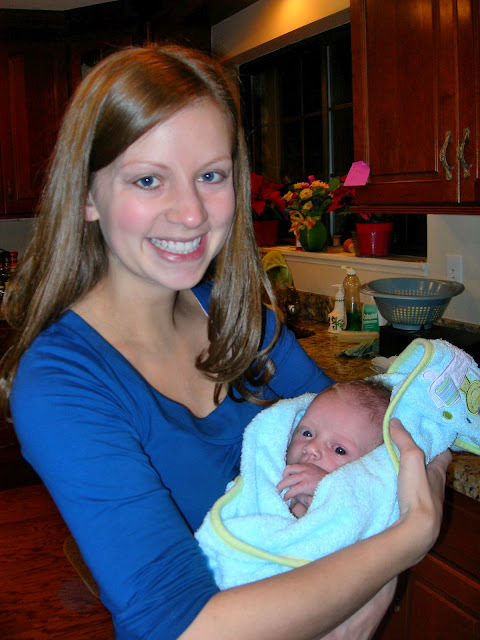 Yesterday marked Blake's one month birthday. We can't believe how fast he is growing. He is rapidly developing a unique personality. He loves to take baths now that he can be in his tub. He had an accident on me at this very moment. 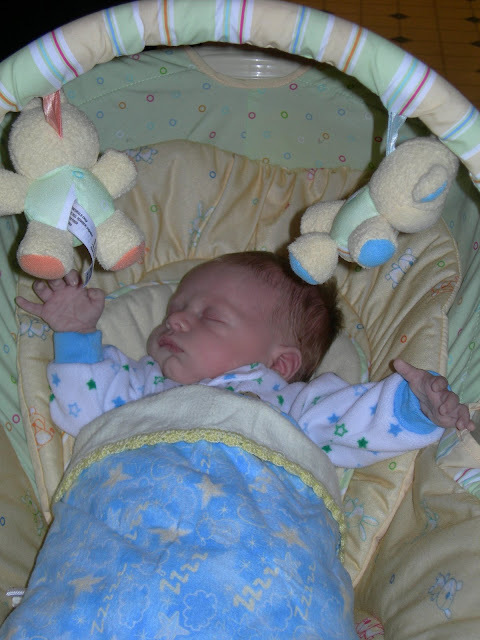 He often gets startled in his sleep, and shoots his hands straight up in the air. He generally holds them there for 5 minutes or more. He looks like he is conducting an orchestra. We sure get a kick out of it. Blake made some diaper box friends. 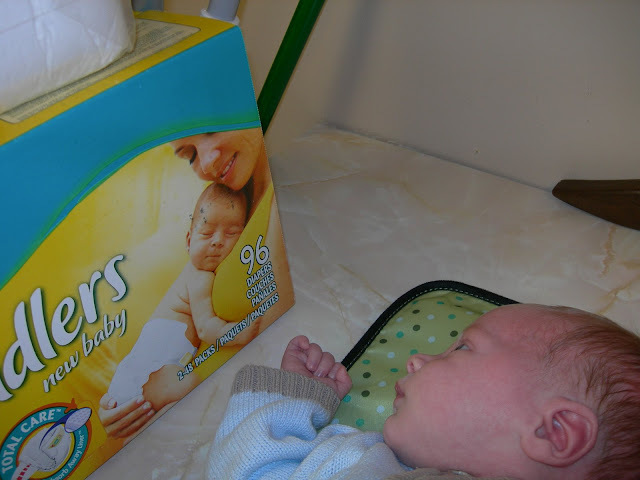 We had the box next to his changing pad at the Tanners' over Christmas, and every time we put him down to change him, he became fixated with the mom and baby on the box. He wouldn't take his eyes off his new "friends." He makes a lot of funny faces. 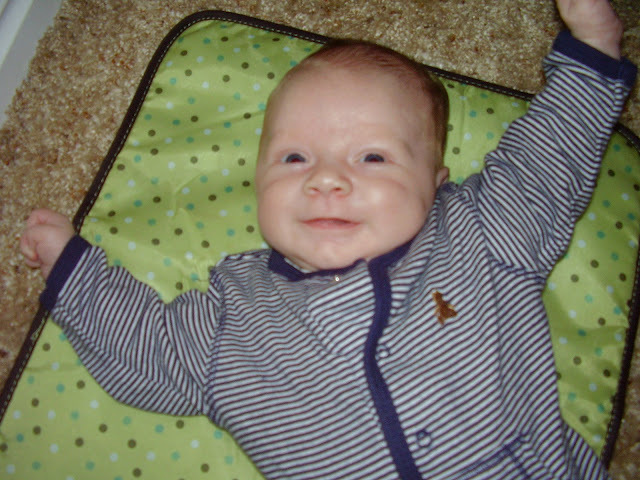 We finally got a real smile out of him and not just those half-asleep smiles. Oh what cute pictures of your little one. I love all the new pics. You tell that boy to stop growing. Auntie Stephanie is on her way!!! So cute! Do you guys know where you are going after Troy graduates yet?? Hi---I am glad you are blogging!! It is nice to see all the pictures since we are so far away! Blake looks like he is growing well and all of you look so good! Hi, I just finally noticed your blog linked on Alisa's. Blake is definitely a very cute little guy. You can tell just from the pictures that he is very happy and content. Ooh, I just want to squeeze those cheeks!